The 2011 World Championships in Athletics came to an end on Sunday following nine days of drama, mishaps and tears of frustration and joy in Daegu. The biennial track and field meet was filled with interesting episodes, but perhaps the biggest achievement was raising global awareness of the Korean city. 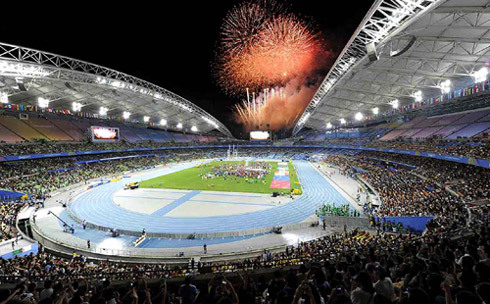 When Daegu won its bid to host one of the top three global sporting events in Mombasa, Kenya on March 17, 2007, international track and field officials were surprised by the ambition and challenging spirit shown by the little-known Korean city. It was a hard-won battle to host the competition. The decision caused skeptics to voice their disapproval, and some officials at the International Association of Athletics Federations, which organizes the Worlds, to express concern that organizing such a behemoth may be beyond Daegu's capability. However the city's hosting of the competition has drawn not only applause, but also talk that the latest edition of the Worlds was the most successful in its history. The city of 2.5 million, which was virtually unheard of on the international stage before, has now appeared firmly on the radar and in the hearts of many athletes and fans. Fireworks light up the sky as part of the closing ceremony for the IAAF World Championships in Athletics in Daegu Stadium on Sunday. While many former host cities of the Worlds -- or the Olympics or FIFA World Cup -- have ended up in debt after constructing new sports stadiums and other facilities that have subsequently fallen into disuse, Daegu is being lauded for its efficient budgeting. The city used pre-existing sports facilities to host most of the events and was able to avoid falling into debt. Daegu Stadium, which was built in 2003, was fitted with a new race track and its sound system received an overhaul, but those were the only major changes made. At the same time, the machines brought in to clean up the sand on the track and retrieve equipment used in throwing events received a "Class-1" rating by the IAAF. The 6,700 volunteers who helped out at the stadium and other venues of the World Championships also played a pivotal role in the event's success. Around 17,000 supporters from 137 volunteer groups not only welcomed and cheered the athletes and IAAF officials, but also served them meals and guided them on tours. The high level of civic awareness demonstrated by the residents of Daegu was also worthy of praise. Local government officials and members of the organizing committee were concerned about being unable to fill the 60,000 seats at the stadium. But thanks to group sales, attendance was high and ticket sales strong. Simple but refined exhibitions and performances, top-notch facilities for athletes, and a focus on environmentally-friendly technology left an indelible impression on the minds of those who visited the city. "Before the competition, there were those who were skeptical about the successful hosting of the event," said Lee Seong-keun, head of the Daegu-Gyeongbuk Development Institute. "But careful preparation over the last four years and the strength of the people of Daegu made it possible for the city to successfully host one of the world's top three sports competitions."